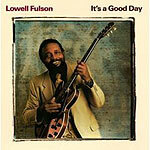 CD review: "It's a Good Day"
Lowell Fulson offer snothing earth-shattering on his latest release; if you're after gimmicks or some new entertainment, keep on looking. What this veteran musician has been doing for four decades  lay down some of the best blues around  he sticks to on his latest release. He uses his subdued guitar style to create individual notes that slowly punctuate his vocals and his band's playing. Keyboardist Ron Levy's piano and organ complement Fulson's post-war urban blues with familiarity and understanding. Fulson's slightly nasal but still rich vocals lead his tight band through a lengthy set of urban blues that shows off one of this country's musical treasures.